Prepare the soil for bulbs well, as you would for any other plant. Remove weeds and incorporate lots of compost or other organic matter. On heavy soils dig in horticultural grit. Bulbs grown in pots need good drainage, so put plenty of crocks in the bottom of the pot and use a well-drained compost. For most of the bulbs that I grow in pots I use two parts John Innes No2 with one part horticultural grit. Specialised bulb composts are expensive and are only necessary in pots with poor drainage. Garden Centres sell bulbs for autumn planting from the end of July and want them out of the way by September to make room for Christmas-tree baubles. August is far too early to plant spring-flowering bulbs. October is the best time for Narcissi and November for tulips. 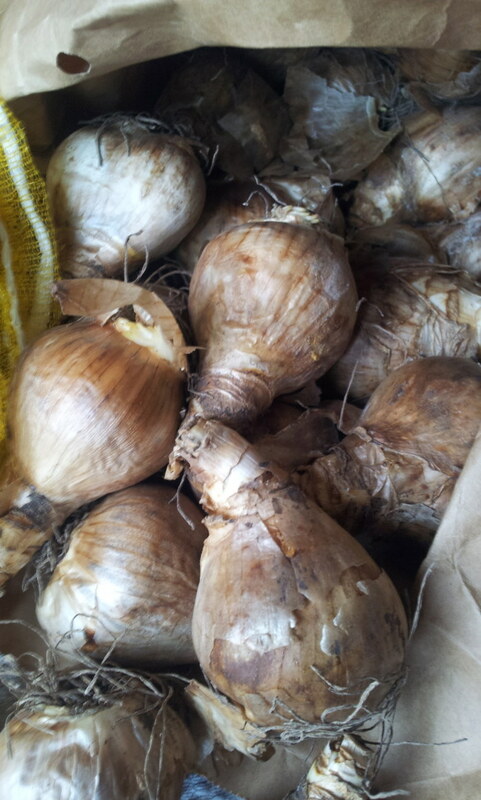 Big, fat and firm are the watchwords when buying bulbs. Reject any that are squishy, soft or showing signs of mould. Small bulbs may not flower in their first year. Ensure bulbs are fat, firm and show no sign of mould or rot. As a rule of thumb, bulbs should be planted in holes three to four times as deep as the bulb itself. So, for example, a crocus bulb that is one-inch deep needs to be planted in a hole three-inches to four-inches deep. Clumps of Fritillaria imperials or F. persica look magnificent but can be difficult to achieve: on heavy soils the bulbs often rot during their first year. Placing the bulbs in the ground on their side will prevent water entering the top of the bulb and reduce the likelihood of them rotting. With most bulbs it is obvious which way is up. If you are not sure, plant the bulb on its side: its stem will find its own way up. The traditional time to start forcing hyacinths into flower is the third week of September, to get them flowering in time for Christmas. There is always a surfeit of goodies at Christmas, so consider forcing bulbs for the lean weeks of January and February. Hyacinths will flower in 10-12 weeks from potting if they are kept in a cool dark room (or under a cardboard box) until they have shoots about two inches tall. Paperwhite narcissi flower in 8-10 weeks from potting and don’t need to be kept in the dark. It is a popular misconception that all bulbs need to be planted in full sun. As well as woodland bulbs such as the dog’s tooth violet, Erythronium, and the wood anemone, Anemone nemorosa, many Mediterranean bulbs grow well in shade. Scilla peruviana has tennis ball-sized blue flowers and soon forms large colonies in cool, shady situations. Its relatives, the Squills – Scilla siberica and Scilla biflora – are aggressive plants that seed themselves everywhere, but the pools of blue they form are irresistible on dull spring days. The star-shaped flowers of Ipheion uniflorum create a similar effect but are less invasive. If you have rich soil with plenty of added leafmould you will be able to grow the sumptuous black flowers of Fritillaria camschatcensis. 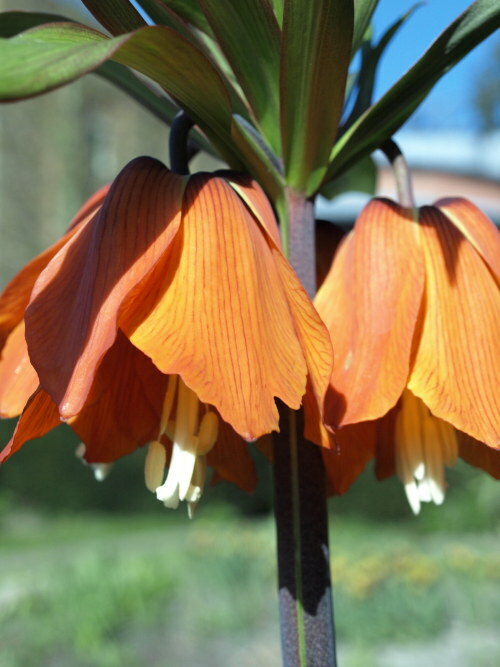 The most majestic bulb for the dappled shade provided by deciduous trees is Fritillaria imperiallis. A friend has masses of the deep-orange form growing against a red-brick wall underneath an ancient fig tree. It’s a glorious sight. Pot-up large plastic pots with your favourite bulbs and, just before they are about to flower, use them to plug holes in the border. Plastic pots can also be slipped inside more elegant terracotta ones and whipped out when the bulbs are over. Store the pots behind a shed to allow the foliage to die down, keep them weed-free, top dress with a layer of compost in the autumn, and bring them out the following year. Plant labels can look very ugly in the garden but are indispensable for marking where bulbs are situated once the foliage has died back. A discrete label will prevent the frustration caused by plunging a fork into a border and spearing a clump of your favourite alliums. The dry conditions at the base of hedges make ideal growing conditions for many bulbs. Tulips, and particularly species tulips, will be very happy on the south-facing side of a hedge, and can be left undisturbed for years. A few bulbs of Tulip whitallii planted at the base of my beech hedge have now formed large colonies. The bronzy-orange flowers of the tulip are still flowering when the first acid-green shoots of the beech appear. On the shady side of hedges, it is easy to encourage carpets of Anemone blanda or the mauve and lavender flowers of Chinondoxa forbesii. There are several varieties of this bulb and all are prolific self-seeders. While the majority of bulbs need a period of dry, even baking, conditions some only thrive in moist soils. In the wild, Camassias grow in rich, moist meadows and need similar conditions to prosper in the garden. Leucojums also flower better in moist soils. The snakeshead fritillary, F. meleagris, only ever flourishes when it is growing in a damp soil. Eighteenth-century gardeners planted tulips individually, the better to appreciate their beauty. Even in informal gardens, bulbs planted singly in small terracotta pots and placed in an ordered manner around the garden bring instant elegance and formality. Use lily-flowered tulips, Fritillaria persica or large-flowered alliums. The biggest destroyer of bulbs, particularly in urban gardens, is the squirrel. Although they will dig up daffodils they tend not to eat them. But they have a voracious appetite for crocus and tulips. Planting the bulbs deeper than normal can help. Bulbs are most vulnerable after planting, when the soil is easy for squirrels to dig. Chicken-wire placed over the pot, or the freshly-dug soil, will deter them. It’s not just crocus that will grow in lawns and short grass. Many miniature irises, particularly Iris histriodes, will be happy in a lawn that does not become waterlogged. Of the dwarf narcissi, the cyclamineus hybrids are the best adapted to the conditions. N. ‘Jenny’, with creamy-white flowers spreads well in lawns. Remove turfs with a spade, place the bulbs underneath and replace the turf. Don’t cut the lawn until the bulbs’ foliage has died down. Bulbs can also be grown in long, rough grass but you need to choose tall varieties that can compete with the height of the grass. Fritillaria pyrenaica grows to about 18inches tall and is easy and vigorous, even in grass. Narcissi are well-adapted to growing in grass, particularly the pheasant’s-eye narcissus, N. poeticus var. recurvus, and the old-fashioned N. ‘W P Milner’. To plant the bulbs, remove clumps of grass with a bulb planter or with a mattock. Wallflowers or forget-me-nots are the traditional plants for planting with tulips. In pots and windowboxes use violas instead – they will start flowering long before the tulips and provide a wide range of colour combinations. The Sorbet series is robust and floriferous. For sheer flower-power bulbs are the cheapest plants available, so don’t stint on the quantities you plant. Even in small gardens massed plantings of a limited number of varieties is always most effective. In pots, allow for a dozen tulips per 12-inch container. Left in the ground, tulips degenerate each year until they die; lifted, stored and replanted the following November they will re-flower well. After flowering remove the seed head and wait for the foliage to yellow and die back, then lift the bulbs, clean off any soil and store them in boxes or net bags in a cool and dry corner of the garage or shed. Plant pots and windowboxes with no more than two ‘layers’ of bulbs. This will avoid the unsightly spectacle of the later-flowering plants appearing through the dying foliage of earlier ones.